The Condor Liberation, which sails between the Channel Islands and Poole, will be out of action for two weeks after an engine fault. This has led to route changes and disruption for people in the UK and France during half-term week. Divers found damage had been caused to the jet propulsion buckets while the ferry was in Poole. In order to carry out the remedial work the vessel has been withdrawn from service until Monday, 6 November. 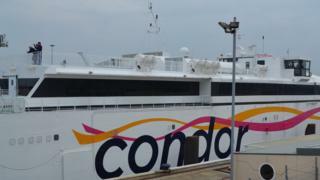 Condor Rapide will operate between Channel Islands, UK and France while the work is carried out to the Liberation. As well as changes to the Condor Rapide route, there will be extra passenger space made available on the Commodore Clipper freight ship where possible. Customers affected, including those in the UK or France for half term holidays, are being called by Condor to arrange an alternative sailing. Chief executive Paul Luxon said: "We believe that with this plan in place, the overwhelming majority of customers will be able travel on the day they had originally booked. "We apologise that these regrettable, but vital, changes to our schedule will cause disruption to our passengers"